After the beautiful article about the RSC1900 in the Yachting World of June 2018, there is a beautiful article in the Yachting World again. It is a test of the Saffier Se37 and the article is no less than 8 pages long. The magazine is now in the store. 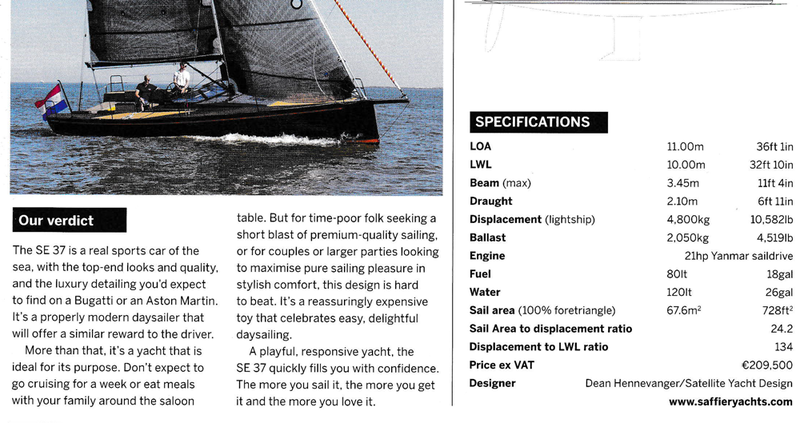 Also all other European magazines have written positive articles about the Saffier Se37 and the sale of this innovative yacht is far above expectations. Although the Saffier Se37 is a fast cruiser, the yacht appears to do also well in a race. During the ‘Ronde om Noord-Holland’ in the dualhanded class, the yacht was the fastest in sailing time with 16-24kts of wind. Due to a mistake at the third start in Kornwerderzand, the Saffier finished third on handicap.